Feminists, now is the time to speak out against female abuse. 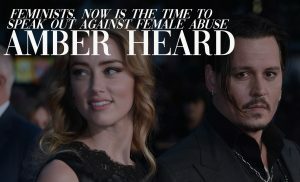 Many of you by now will be aware of the domestic abuse allegations directed towards Johnny Depp by his ex-wife Amber Heard. The accusations came as a shock to fans, myself included, who had always considered him to be more of an oddball and an introvert than a physical threat. He always seemed so docile, so vulnerable in interviews — an awkward and somewhat humble person living in houses strewn with guitars, vintage typewriters and packets of tobacco and liquorice Rizla packets. While I could see quite clearly that he had invested most of his adult years indulging in life’s pleasures, the image of him as an abuser just didn’t ring true to me. I hadn’t heard much about Amber Heard until that point. I didn’t know which movies she’d been in or what she did for a living. I didn’t recognise her on the cover of magazines. To me, she seemed like a cookie-cut vision of a ‘model slash actress’. Nothing particularly stood out, but I had no reason to dislike her. That is, until I picked up a copy of The Times Sunday Style one afternoon and happened across an interview discussing her recent allegations towards Johnny Depp. Something stuck out to me, and it stayed with me until now, leaving me with an unsatisfying feeling of vindication. One of the first points which Heard brings up to the interviewer is the Brett Kavanaugh case — which at the time would have been in full swing. There was just something in that moment which, to me, felt so vulgar — so forced. It didn’t seem to matter who the interviewer was or what her opinion on the Kavanaugh hearing was — as far as Amber Heard was concerned, she was a ‘sister’, and it was Amber’s job to protect and soothe her from life’s ills. This attitude is prevalent within feminist and celebrity circles alike, a hug-fest for any woman who has ever been shouted at by a builder in the street, touched inappropriately in a nightclub or coerced into a sexual act. While these are issues which I feel strongly about (some more than others), they alone do not classify as registration to the ‘sisterhood’ in my opinion. I’m somewhat of a private person when it comes to my own experiences with issues of mental health and domestic abuse, but that’s not to say that these things have not affected my life — they have. In many ways my past has shaped me into the person I am today and affected my decision making when it comes to which ‘side’ I find myself aligned to politically, as well as the company I keep. I am someone who would not consider myself a feminist — much to the bewilderment of journalists and friends alike — who assume I must be going through some sort of ‘phase’ or that I’ve been brainwashed by my ‘far-right’ cohorts in the ‘manosphere’. Perhaps I’ve internalised their toxic masculinity to hide my own personality flaws, or I could be an opportunist — feeding from a movement lacking in female representation. Either way, it’s not a popular stance to take. Years before I was known as a ‘far right activist’ I attended a Sisters Uncut meeting about domestic abuse, where I opened up about my past troubles. One woman was nodding her head enthusiastically as I described my experiences. I explained that sometimes I found myself ‘becoming’ my ex, exhibiting signs of residual trauma which was expressed in the form of verbally abusing my own friends and partners. The only person who understood what I was saying was this woman, an abuse survivor herself. We shared a few dark-humoured jokes and laughs, to the bewilderment of the intersectional gender-neutral crowd, who simply sat in awkward silence averting their gaze. I was told that my BPD partner should be put in prison, to which I responded that would be the worst option for him — that he was in pain and needed intensive therapy. Again, silence. 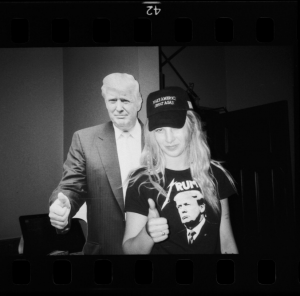 Later on down the line, when I dared to write a review of The Red Pill by Cassie Jay, and when I filmed a protest outside an art gallery in London, I was called a ‘fascist’ by my ‘sisters’, and booted out of the chat group with no chance to explain myself. The irony of a domestic abuse group ‘cancelling’ a domestic abuse survivor for daring to think for themselves did not escape me, and I did not forget it. With that in mind, I watched the so-called ‘cancellation’ of Johnny Depp with some scrutiny – as the focus shifted towards whether or not he deserved to feature in J.K Rowling’s recent adaptation Fantastic Beasts: The Crimes of Grindlewald. Rowling, a domestic abuse survivor herself, defended Depp’s role in the film. After watching it in the cinema I scoured YouTube for reviews and I noticed that many of the vloggers seemed to be unhappy with the casting, citing that they ‘weren’t sure’ why he was chosen, ‘given the circumstances’ and that they’d ‘heard some really disturbing stuff’ about him. Articles also started appearing asking us ‘what do we do when the art we love was created by a monster?’. This all came at a time when the allegations were just that, allegations. Again, something felt wrong. But I daren’t dispute Amber Heard, the ‘darling of the #metoo movement’. Doug Stanhope, a comedian and friend of Depp’s, also spoke out about his suspicions of Heard prior to the allegations as far back as 2016 — despite admitting that he was nervous about making the claim publicly. In light of the recent evidence presented to the court by Depp’s legal team, I have to say that I am fairly confident with my prior judgement. It’s hard to speak candidly without coming across as a bogus know-it-all and a bad person, but in all of the interviews and content I have seen of Ms. Heard, nothing seemed to resonate with me. Call it superstition, call it experience, I just didn’t believe her. It feels so dirty and wrong to write those words, but there it is. I wish that I had voiced it sooner, but how can you do so in this climate? And I don’t doubt for a second that her looks and her status had something to do with that. The last thing anyone wants to do is make the assumption that because a woman is successful and beautiful that she can’t be the victim of abuse. That is what the entire #MeToo narrative was set up to dispel. But as the case unfolds and Depp’s legal team continues to provide evidence countering her claims, I find myself growing increasingly furious. The fact is it is all too easy for sick people to exploit these issues for their own personal gain. Everybody wants to be part of the group hug, the healing circle. Nobody wants to think of themselves as being on the wrong side of history, of siding with the abuser. And by the looks of things, that may be exactly what a great deal of people may have done in this instance. I am highly concerned by what I have seen so far, in particular, the images of Johnny Depp’s shattered finger and visible bruising to his face. We must take the allegations against Ms. Heard as seriously as those she has made towards her ex-husband, perhaps even more so. She may well be guilty of not only domestic abuse, but potentially fabricating hoax attacks against herself for financial gain and celebrity status among her peers. The latter of which I would consider the same as spitting in the face of myself and the hundreds of thousands of abuse survivors the world over — male and female. So long as feminism can be used as a cloak to hide domestic abuse against male partners, it will continue to remain a word which leaves a bitter taste in my mouth. I have been a die hard fan of Johnnys for 30 or more years now and was completly heartbroken when the media rushed to judgement when the allegations came out against him. I have always known that he is much to kind and has too much integrity to ever do anything of this sort. I am praying that the truth will prevail ! And for those of you who think Heard is beautiful, remember friends, “beauty is only skin deep”. ive been following this case since day one, back in may 2016. thank you for your article. it resonated with me 100%. Thank you for this! I never believed her allegations. Great honest article! I have been following this case for nearly two years now and knew that she was not the victim in the relationship for many reasons that are easy to reference online, but people will want to believe the beautiful woman as you point out. This also reflects the general attitude towards domestic abuse against males, which is far more prevalent than people realise, because the victims are ashamed, mocked and vilified or not believed, as were females and children for so many years. As you say, we must take ALL abuse allegations seriously but don’t cancel people on the back of tabloid fodder. That’s what the legal system is there for. Thank you for voicing your concerns. Thank you for saying what many people think, have thought from the start and even had predicted much before the allegations.